Essex County, NJ is a great place to call home and is well known as an easy commute by bus or train to NYC. Located in the Northeastern part of New Jersey many residents are able to enjoy the view of the New York City Skyline. If you are in need of installing a new air conditioning system, or if you need repair and maintenance of your current air conditioning system, Bloomfield Cooling, Heating & Electric, Inc., are the experts in this field. We also sell and install the popular ductless Mitsubishi cooling and heating systems for those unique spaces that are difficult to cool because they are not conducive to the traditional central AC ducting. We have been servicing the area of Essex, Hudson, Bergen and Passaic Counties for over 27 years. Bloomfield, Cooling, Heating & Electric, Inc. is family owned and operated. We are fully licensed and insured. Our technicians are all factory trained and certified to work on most air conditioning systems such as Carrier and Mitsubishi. Our Electricians are all licensed by the State of New Jersey and qualified for all phases of the work that is involved with upgrading your new air conditioning system. We do not believe in hidden fees and extra costs – we offer up front pricing and take great pride in our superior customer service. Our current specials are being offered to homeowners in Essex County. Right now, you can save $500.00 off on a new air conditioning system and for those who qualify we can offer a special no interest financing program. For homeowners with an existing system, call us to take advantage of our maintenance program for $89.99, a regular value of $149.99. We highly recommend a general maintenance plan that will provide annual service on your air conditioning system. It helps to insure that the system runs more efficiently and it helps to extend the life of the system, saving you energy costs and repair costs. We at Bloomfield Cooling, Heating & Electric, Inc. take great pride in our unblemished reputation. We will never sell you anything that you do not need. We educate our customers during the entire process on how to run the system which is just a small part of our customer service. Our goal to providing excellent products and excellent customer service has been acknowledged by Angie’s List with their Super Service Award in three categories HVAC, Generator and Electrical for ten years in a row. 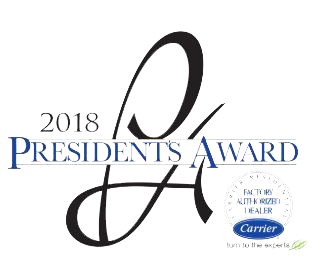 For two years Suburban Essex readers have honored us with the Gold Reader’s Choice Award as BEST HVAC Contractor and most recently, we received the coveted President’s Award by Carrier. We are grateful for our customer base which has grown with us over the years and the many referrals we service. We believe that quality products sell themselves. It is the excellence of service provided by Bloomfield Cooling, Heating & Electric that allow us to stand apart from the rest. If you believe you deserve the best “White Glove” service, do not hesitate to call our professionally trained customer service representatives and set up a convenient appointment for a free on-site evaluation by one of our experienced, certified technicians. Call us at 973-237-0505.